Room for up to 7 Credit / Debit cards. Crafted with a special lining to shield your Credit and Debit card's Radio Frequency Identification (RFID) chips from unwarranted electronic scanning with a RFID Blocking material. It will protect your Credit cards / Debit cards / ID cards etc from identity theft, blocking external scanning devices and electronic pickpocketing. 2 Extra slip-in card pockets for Membership or Store cards. 3 Window slots for a Driving Licence / I.D cards / Pictures. Wallet size: 12cm x 9.8cm (When folded). It says "soft vegetable tanned leather" - which refers to the tanning …It says "soft vegetable tanned leather" - which refers to the tanning process, not the leather itself. And here's me thinking the wallet was made from potato skins. In my mind, 'soft vegetable leather' isn't 'real' leather. It says "soft vegetable tanned leather" - which refers to the tanning process, not the leather itself. Looks a good price(Lowest on Camel), picked up the brown variant RFID shield is a nice touch. Thanks OP. Join the waitlist for the brown one as that just went. 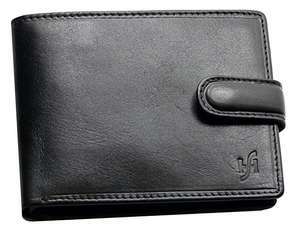 Black Wallet has had more stock added on the deal, 66% you need to select the lightning deal to get the price of £9.90. Both colours are in stock now. 100% claimed im on the waitlist now. Did they? They also claimed that tinfoil hats stop the government from stealing their thoughts. This doesn't come out too well on Fakespot - Grade F - over 50% of reviews deemed fake. If you hit re-analyse you get a more up to date version - it's A now. Always worth doing this when the total number of reviews is very small.